I know I usually review soccer cleats, but it was difficult to turn down the opportunity to test and review one of the most talked about soccer balls of all time, the Jabulani. This is the Official Match Ball of this summers World Cup in South Africa, and it is evident that a lot of time and research went into perfecting its technology. After having it for a week, I can tell you right now that this ball should be nicknamed the ‘Dancer’, because this ball can move! I figure there is no point talking about all the technical stuff, so here are some stats about the ball, and then straight into the review. The number 11 is signified in different ways by the Jabulani ball: 11 lines with 11 different colors are used to honor the 11 languages and tribes of South Africa. It is also the 11th official World Cup ball and if you didn’t already know, there are 11 players on a soccer team. 8 thermally-bonded, spherically-shaped, 3-D EVA and TPU panels surround the ball, ensuring the ball is perfectly round and keeps its shape. The ball is surrounded by GripnGroove technology, allowing it to be aerodynamically advanced. This provides flight characteristics not seen on any other ball. Take Some Time to Test! I have had a week with this ball, and had the opportunity to test it out almost every day. From day 1, you will notice that there is something rather unique about the Jabulani! I strongly advise that you test it out yourself in a few training sessions before using it in a game for one simple reason; the flight off this ball is extraordinary, and not allowing yourself the opportunity to test it out will leave you looking a little clumsy on the field! Trust me, I am telling you this from experience. I took it out with a few friends for a kick about on day 1, and I spent most of the session trying to work out how to judge the ball’s flight trajectory. This is primarily due to the GripnGroove technology used on its surface. Adidas have added little ridges that surround the ball in many circular shapes that can clearly be felt when holding it. Like the dimples that surround a golf ball, GripnGroove’s function is to improve how the ball passes through air; basically it enhances how aerodynamic the ball is. My problem was that the Jabulani held up in the air longer than I have ever experienced with a soccer ball. Every time I tried to take it out of the air, it would end up landing several yards past where I expected. Another great aspect to the Jabulani is the fact that it doesn’t have noticeable panels keeping it together. I am sure at some stage, you will have played with a 32 panel ball, and you will be familiar with how you can feel the gaps in between each panel. Well, with the Jabulani, each panel has been pieced together and thermally bonded, so that you don’t get the same gaps in between panels. This leaves the ball a lot smoother, and is another key component to why it moves so fast. I did familiarize myself with the flight pretty quickly, and it became pretty easily to play long balls. Here is the secret to the Jabulani: If you hit a solid, controlled shot that flies straight, it will stay ultra straight. Bonus being, you will get an extra 10 yards out of the ball with a nice little dip at the end. But, if you put some spin on the ball, it moves! When I say the ball moves, I mean it dips, and weaves, and turns like no other! The Jabulani is going to be every goalkeeper’s nightmare, and every striker’s greatest Christmas gift. To be honest, I can’t wait to see Cristiano Ronaldo strike this ball, because when he does it could be spectacular! I spent some time taking shots and it absolutely pings. The Jabulani is a very light ball and when you strike it clean it moves fast. In a sense, it reminds me of a plastic ball and it sounds plastic when you bounce it. Striking it is a different story, as the ball feels like a leather ball, only it seems to encompass your foot when you strike it. When you control the ball off a long pass, you can feel the energy of the ball on your foot. Even though it is super light, there is a lot of power hidden inside! 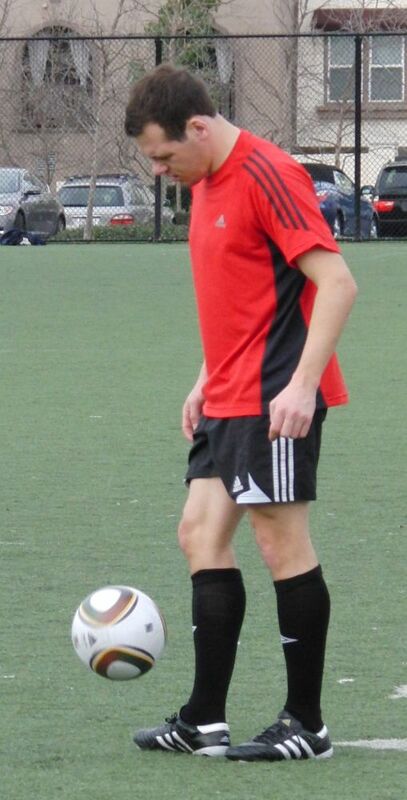 Last weekend, I took the opportunity to use the ball in a game to gauge the opinions of some fellow players. The resulting views were all very similar, with a lot of guys pointing out the fact that the Jabulani moves super fast and ends up playing longer than expected. There is only one way to understand what this ball is all about, and that is to test one for yourself. If you get the opportunity to try one out, you will understand what I mean when I say that putting some spin on this ball makes it move. As I stated above, there is something quiet unique about this ball, and I am sure that future designs will be created using the same technology seen in the Jabulani. Let me finish up by giving you 2 tips; anticipate the ball flying further than you expect, and when you get to shoot remember that by using the Jabulani, you already have an added advantage over the goalkeeper! Jabulani ! Celebrate World Cup 2010 with the official match ball from adidas! I've only got the Top replique version of the Jabulani cos I can't afford the actual one but I'm glad I did as it was pre pumped well and the thermobonding makes me rest easy that it won't tear apart at the seams. I would love a Jabulani, but I might only be able to afford a t90 omni or something like that. i have the top training ball and it really is awesome. the ball is very nice and i look forward to seeing if it is any good in the fields i play at. One question…I saw grips all over the jabulani's surface.What happens when player hits the ball header?Will he keep his skin on the head? How does one get this ball? I have seen the price listed as being from $19.99 to $149.99. Certainly I don't want to pay $149.99 but I do want the actual ball. The small groves are very minimal and will not take any skin off your head! If it did, Adidas would not be selling it. The actual World Cup ball will be sold for $150, while a replica version costs $20. If you are not going to use the ball in competitive games you will prob be better off buying the $20 version, even though it does not use the same technology as the Jabulani. Jabulani is horrible. Why it is used without a long trial? I have just watched the first five games in SouthAfrica, and you can notice how the players are surprised of the ball's behavior. When good strikers shoot the ball at a foul shot, the ball goes like a bullet high above the goalie!!! if you buy the replics for 20 dollars, does that have the grip and groove technology like with the little bumps? The $20 version has a smooth surface, it doesnt come with the Grip'n Groove technology. What will be the weight of the ball…. I have actually played with one, and I can say that it would b e a waste of money to buy this ball. it "knuckles" like a base ball every time I kick a solid shot, unless it is pumped to maximum pressure, which kills any sort of accuracy I have at freekicks. The Germany 2006 ball was good. I don't see how the ball needed to be so drastically changed. Nike ascente= very good buy,i recomend it. i have the ball. honestly it's great. it feels good when playing and its the best ball i have played with yet. I would like to know if there is only 100% air in the ball or do they also put a percentage of hellium in the ball. It is ridiculous that they have introduced a new ball using new technology just before the `World Cup`. The ball used in the English Premiership gives lots of great goals. The matches using this ball so far have been disappointing. No great goals from Messi or Rooney or Ronaldo. It seems like they are selling a plastic supermarket ball for between 20 and 120 dollars. ball has been a total failure. Why can't they leave well enough alone? After cheking the internet the best world cup ball of all time has been France 98 "tricolore" it's the perfect balance between technology and classic design. I hope you will be fine and doing well. I would like to introduce myself. My name is Naveed Ashraf from Sea Dream Sports, Sialkot – Pakistan. I am manufacturers and exporters of all kind of Soccer balls and equipments. If you want to see our quality products, please donot hesitate for contact us. I will send you sample for your checking and approval. Thank you and best regards, have a good day. Neka Pura, Sialkot – Pakistan. i dunno if this i should really buy this thing or not! and i ocationaly take some shots on goal! and yeah thats really all! so if any one nows if i should get it! ohhh (and if your going to say to me to get ANY nike ball i will deni the recomendation) i don't agree about the child labor! 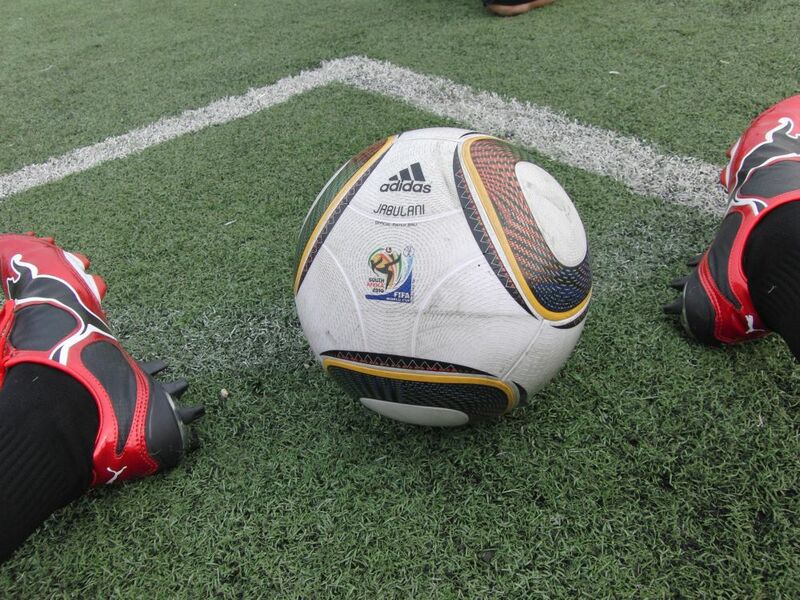 wow it is aesome to have jabulani with its nice cool cleats…….. This might be the worst ball i have ever played with. It was unpredictable in both flight and even on the ground, I even had one hop completely over my foot as I went to cushion a pass, with no noticeable debris on the pitch to change the direction of the ball. This and the Fevernova have been the worst balls adidas have ever made for me personally.